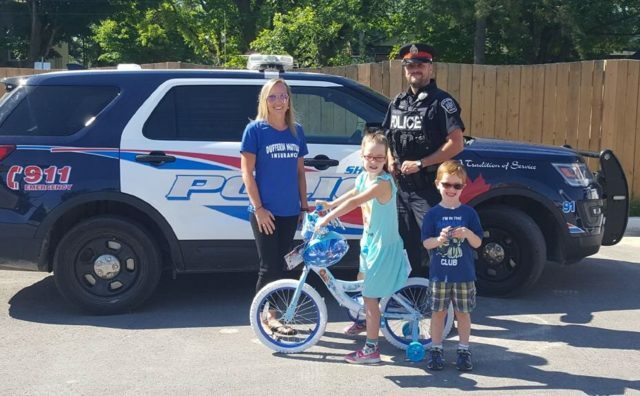 On July 1, 2018 the annual Shelburne Police Service Canada Day bicycle draw was held at the a Canada Day festivities at Fiddle Park. Jeremy Janisse and Bella Gardiner were named as the male and female winners respectively. Every June Shelburne police officers watch for children who are exhibiting safe cycling habits such as wearing a bicycle helmet. Officers issue these young cyclists “Safe cycling tickets” and their names are entered into the Canada Day draw. Dufferin Mutual Insurance is the generous sponsor of this annual event and their generosity is very much appreciated by the Shelburne Police Service. Event coordinators PC Andrew Fines and PC Bob Fudge stated that “we are very thankful for the generous sponsorship by Dufferin Mutual Insurance; they truly are a great community partner”. The Shelburne Police Service reminds all cyclists to practice safe cycling habits and to always wear a bicycle helmet. Between January 4 and January 31, 2018, citizens from across the province were asked to participate in a Community Satisfaction Survey supported by the Ontario Provincial Police (OPP) to measure public opinion about the services provided by the OPP throughout the province. Topics of discussion included the handling of crimes, marine and all-terrain vehicles (ATV) patrols, highway safety and traffic enforcement, response to major occurrences and more. Overall, the survey revealed that 97.5 per cent of respondents felt ‘safe' or ‘very safe' in their communities and 95.5 per cent felt ‘satisfied' or ‘very satisfied' with the overall quality of services provided by the OPP. When it comes to highway safety, 62.9% of respondents were ‘very satisfied' or ‘satisfied' with the OPP's enforcement of distracted driving laws. The information that is collected annually through this survey informs the OPP's goals and objectives in support of a safer Ontario. Between Sunday, July 15 and Saturday, July 21, Dufferin OPP detachment participated in a Safe Truck Initiative, stopping 19 commercial vehicles and laying seven charges under the Highway Traffic Act. Of the seven charges, five were for following too close and one each for speeding and a moving violation.